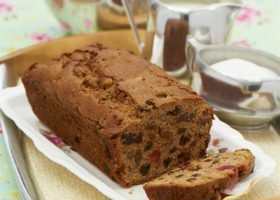 No teatime would be complete without a slice of this light crumbly fruit cake in the 1950s so put on the kettle, lay out the tea tray and tuck in! Set the oven to 180°C, 160°C fan, gas 4. Line a 900 kg (2lb) loaf tin with baking parchment. Place the butter and sugar in a large mixing bowl and beat until light and creamy. Gradually beat in the eggs until smooth. Add all the remaining ingredients and stir well. Place the mixture in the cake tin. Bake for 1 hour – 1 hour 10 minutes, until a skewer comes out clean. Allow to cool in the tin for 10 mins, then turn out and allow to cool on a wire rack. Serve sliced. This cake will keep for up to 1 week in a cake tin.